IF you remember, my friend and press colleague Margie Quimpo-Espino of the Phil. Daily Inquirer, suffered a brain aneurysm on Nov. 29, 2008. It's been a year since that happened and Margie is now talking, texting, and baking even! The last time we chatted via Facebook (yes, she's back on it! ), she said she was still having difficulty walking. But other than that, she really sounded extremely fine and grateful for everyone's prayers and continuing messages of concern. On Monday, Dec. 7, a book on about her ordeal and triumph in the face of much suffering, will be launched at the Powerbooks Greenbelt. 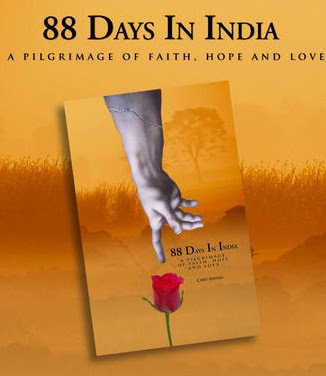 Entitled "88 Days in India: A pilgrimage of faith, hope and love", the book is authored by Margie's husband, former Inquirer reporter Chet Espino, and is now available at all Powerbooks branches. Pls. get a copy of this book and be inspired with Margie and Chet's story.